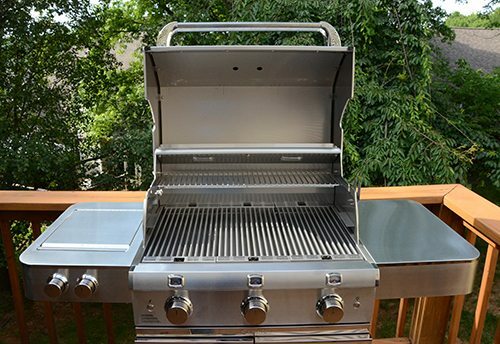 Are you planning to have a gas grill for your backyards, then we would recommend you to hold on for a while. We're going to review one of the most premium grill called ‘Saber SSE 1500 3-Burner Infrared Gas Grill’. It's a matter of a few years ago when the parent company of Char-Broil called W.C Bradley took away the advantage of Char Broil’s infrared technology and introduced a new series called Saber Grills. 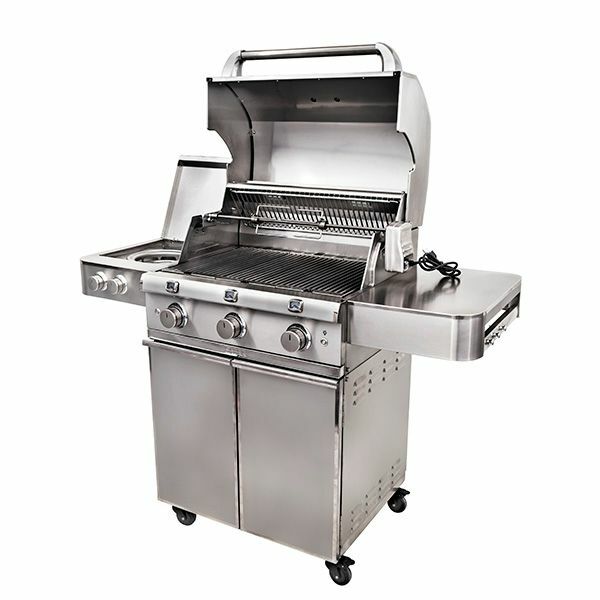 Saber is an independent company who always believe in improving their grills. These Saber grills use an improved version of Quantum Infrared Technology which turns low BTU output to high BTU. One thing about the Saber is quite clear, they never compromise on the quality of their products, no wonder if they've to charge more for that. So stay connected and read one of the full saber grills review. We know very well that for many of you looks matters a lot. This is why we've got a separate section for design and looks in this article. This Saber SSE 1500 is completely constructed by high-quality stainless-steel and looks durable and beautiful. Being stainless steel, it is not only easy to clean but is also long-lasting appliance. To clean the exteriors, all you have to do is swipe the body of the appliance with a damp cloth. It has a very systematic stainless-steel control panel with three knobs in the front and two separate knobs in the left. On both the sides of this device, there's a table on one side and burner at the other. At the bottom, it has a sufficient storage cabinet with two stainless-steel doors for stocking refreshments and condiments. At base, there are gliding caster wheels for easy movement of the appliance. 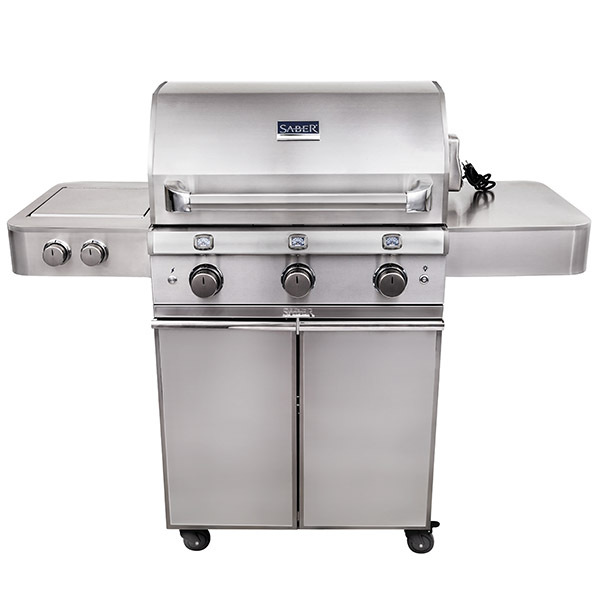 Like all other conventional gas grills, this Saber SSE 150 Infrared Gas Grill has three stainless-steel tubular burned at the bottom. One thing which we like the most about this device is, its burners are placed in separate boxes which means every burner has the heat zone of their own. All the heat generated gets concentrated on the stainless-steel sheet of perforated metal, lying under the cooking grates. In this way, the cooking grates and emitter radiate the heat, and your food is cooked. The functionality of the device is easier and safer too. The grease present in the grill never reaches towards burners; hence there's nothing called flare-ups. Moreover, it has infrared heating which easily distributes, and also the airflow towards cooking grates reduces the risk of burning the food. This appliance has 675 square inches of total grilling space, with 500 square inches of primary cooking area. Talking about burners and powers, it has two separate side burners which have a remarkable heat output of 18,000 BTUs-per-hour while the main three burners have a heat capacity of 8,000 BTUs. So from the main burners, the actual output is of 24,000 BTUs. In the cooking area, there is lighting present which allows you to perform grilling even in the dark. Beside this, for easy lighting of the burners, it has Individual Electronic (AA-Battery) Ignition. ● A 10-years warranty over the burner tubes and carryover tubes. ● A 5-year warranty over cooking grates, warming rack, emitter, and burner box. ● It Comes with 2-year warranty over the painted parts and all other remaining parts. Everything is made of 304 commercial grade stainless steel. This grill comes with rotisserie kit and cover standard. Water may enter inside the grill and drip pan.